At Three Rivers Medical Center, we understand that women have unique health concerns so we work to offer services designed to address the needs of women of all ages. From preventive education and screenings to maternity care, we support women’s optimal health and wellness. From routine gynecology checkups to specialized cancer treatment and senior health concerns, your comfort and health are our priority. The first step to keeping on the right track toward better health is finding the right provider. Kurt Jaenicke, MD FACOG, a member of the medical staff, is a board-certified gynecologist and fellow of the American College of Obstetrics and Gynecology. Dr. Jaenicke has a subspecialty in female pelvic medicine and reconstructive surgery and treats a variety of gynecological disorders. 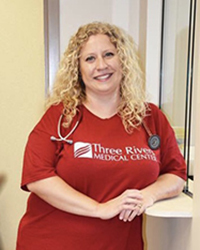 For more information on Dr. Jaenicke, and the services offered at Three Rivers Women's Care, please visit www.ThreeRiversWomensCare.com or call 606-638-9572 for an appointment. Lisa Skinner, MD is a board certified gynecologist and certified menopause practitioner; one of twelve practitioners in the state of Kentucky. Dr. Skinner treats a host of women's issues of all ages, and a variety of disorders. Her interests include minimally invasive surgery, prolapse surgeries and alternatives, menopause medicine, and adolescent gynecology. Dr. Skinner went to medical school at West Virginia University and was a resident at WVU division at CMAC. She is board certified and living locally. Karen Moore, APRN went to Ohio University for her masters degree. She is a Family practice provider with a breadth of knowledge in a variety of areas. We are proud to have her add to our team!